If you have acne-prone skin, you may have become accustomed to some breakouts leaving scars behind. But that doesn’t mean you have to just accept those unsightly marks on your forehead, chin, neck, shoulders or wherever acne decided to make its presence. Acne scars are the bane of existence for anyone with recurring acne. While the easiest solution is to leave your acne alone and let it heal naturally without poking and prodding, it is also near impossible. Our fingers seem to seek out the itchy and painful acne on their own accord. Picking on acne cannot be helped most of the time, and it gives way to horrible scarring. There are many beauty products in the market, different creams and serums that come with a promise of good results. While most are expensive, these products don’t amount to much in the way of results. Often, the results are short term and your skin becomes reliant on such chemical-laden products. Natural remedies, on the other hand, are inexpensive and effective for the most part. They also come with an assurance that you’re not using something that may harm your skin in the long run. Go through these simple natural remedies and find the one that suits your skin the best. Keep up with the routine and you’ll soon see the difference. 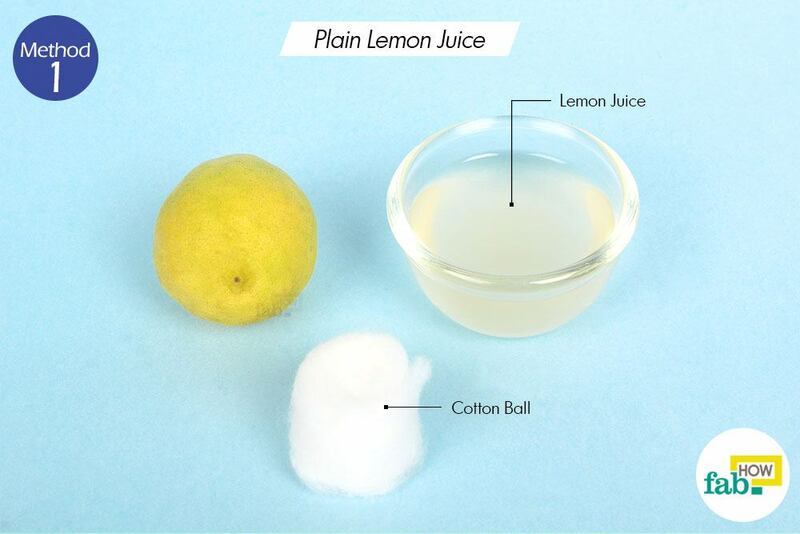 Being a natural bleaching agent, lemon juice is an obvious solution when it comes to dealing with acne scars. With regular topical application, it delivers great results. If used diligently for a considerable period, it can significantly lighten old and dark acne scars. It also banishes freckles and blemishes, de-tans the skin as well as makes the skin light and even-toned. Moreover, the vitamin C present in lemons boosts collagen production, making the skin smooth and firm. 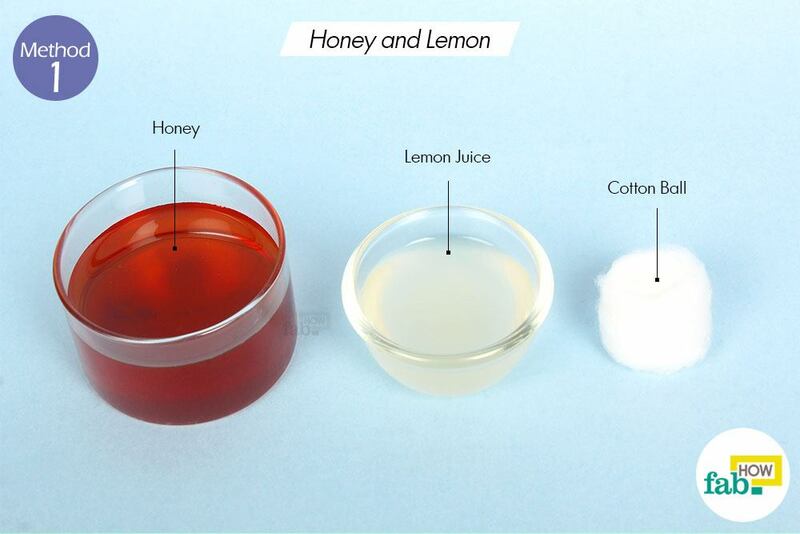 Depending on the sensitivity of your skin, there are different ways you can use lemon juice to treat your acne scars. Since lemon makes your skin photosensitive, it’s best to apply it after sundown as you should avoid sun for at least a few hours. 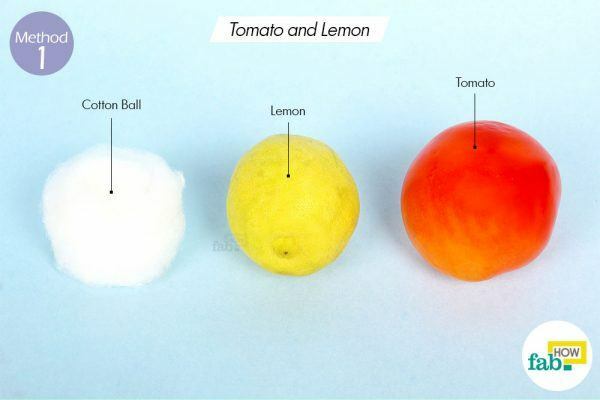 Squeeze a little juice from a lemon just before you intend to use it. 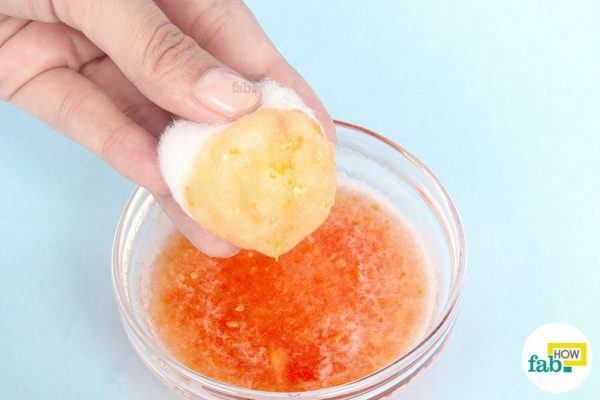 Dab the lemon juice on your acne scars using a cotton ball. Let the juice dry naturally before rinsing it off with cool water. Follow with a light moisturizer to hydrate your skin. Repeat the process daily for at least 1 month to fade the acne scars. Put some freshly squeezed lemon juice in a bowl. Add an equal amount of honey to the lemon juice. Honey, which is extremely hydrating, is a great agent to counter the drying effects of lemon. It keeps the skin hydrated and smooth. Honey also heals damaged cells, gradually diminishing the acne scars. Apply this blend on your acne scars using a cotton ball. Be prepared for a sticky sensation on your skin for some time. Leave the lemon and honey on the scars for about 10 minutes. Wash it off with plain water and pat your skin dry with a soft towel. Repeat this daily for at least 1 month for promising results. Put some fresh raw tomato pulp in a bowl. Add an equal amount of freshly squeezed lemon juice to it and mix evenly. Like lemons, tomatoes are acidic in nature and act as a skin-lightening agent. 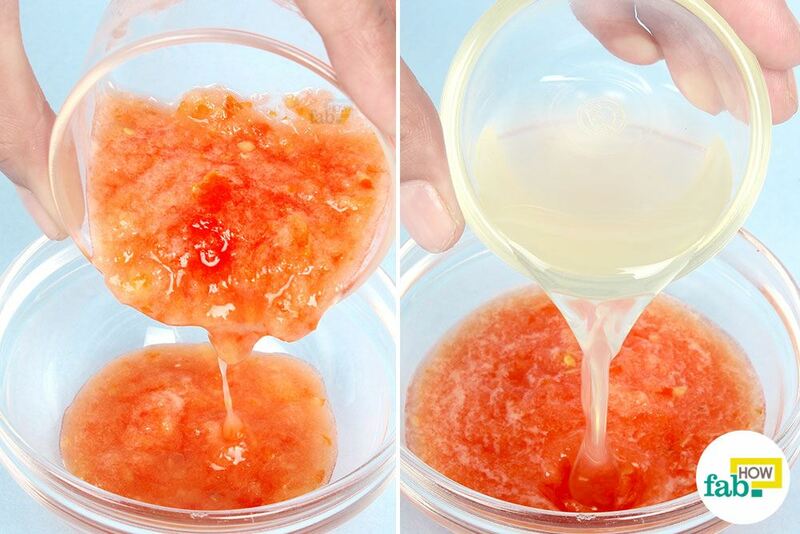 Being an effective natural scrub, tomato also exfoliates the skin. In addition, it repairs and rejuvenates the skin on a cellular level, reducing the appearance of scars. Apply the mixture on your acne scars using a cotton ball. Let it dry on its own. Wash off the dried tomato pulp with plain water. Using this remedy once a day regularly for a few weeks should yield good results. Baking soda is a great exfoliator. It diminishes acne scars by gradually exfoliating the scar tissue over time. It also boosts the production of collagen, making the skin firm and smooth. Baking soda essentially discards old, scarred skin over time, allowing new skin growth to replace it. 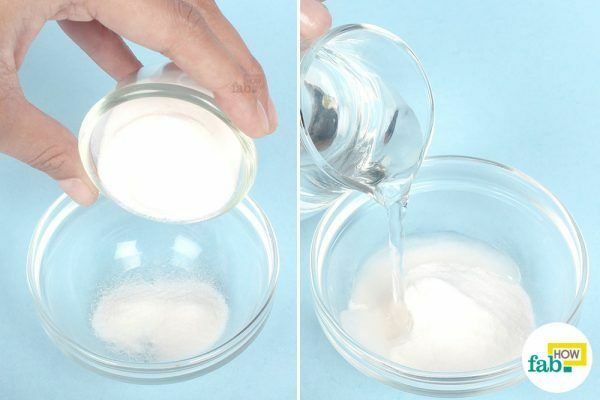 Put some baking soda in a small bowl. Add a little water to make a thick but spreadable paste. Apply the baking soda paste on the scarred skin. Lightly massage the scarred area for 1 to 2 minutes. Let the paste dry, then wash it off with plain water. Apply some moisturizer if your skin feels a bit dry. If you have oily skin, use a light moisturizer. Repeat this remedy daily for 1 to 2 months to diminish the appearance of your acne scars. 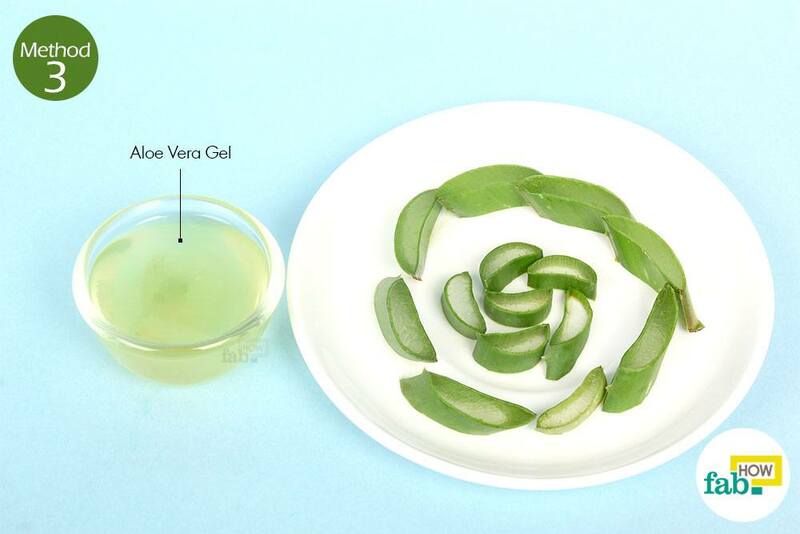 The healing properties of aloe vera are astounding, so it’s probably no surprise that it can help heal acne scars. Aloe vera has antimicrobial and anti-inflammatory properties, along with a multitude of vitamins and minerals that promote healing. It is also the safest option for people with extremely sensitive skin who can’t use many other remedies on their skin. Extract some fresh gel from an aloe vera leaf. Add a little water to it to make a thick but spreadable paste. 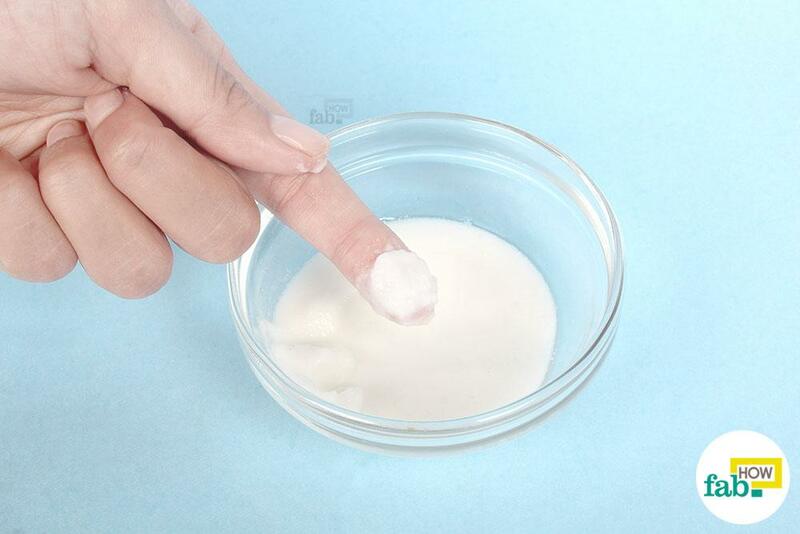 Apply the paste on your acne-scarred skin with your fingertips or a cotton ball. Leave the gel on your skin for at least 15 minutes, or overnight if possible. Wash it off with plenty of cool water. When used regularly for a few months, this remedy should be effective in making your skin healthy and free of scars. Aloe vera is gentle enough to be applied overnight and multiple times without any side effects. 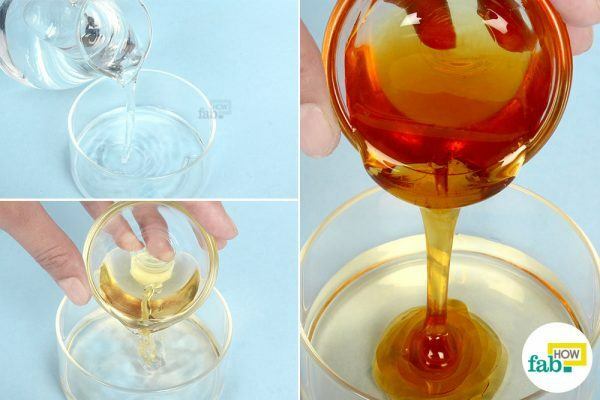 It can also be combined with other remedies to speed up removal of acne scars. While aloe vera gel is readily available in the market, there is nothing like fresh aloe vera gel. An aloe vera plant is easy to keep and requires very little attention. Having one in your garden or in a pot can provide you with innumerable beauty and health benefits. If you have acne-prone skin, tea tree oil can help with acne scars as well as preventing and treating acne breakouts. Tea tree essential oil has antimicrobial as well as anti-inflammatory properties. It checks the infections and speeds up healing. It clears the skin and prevents the formation of scars. With consistent use, its healing properties also help lighten existing acne scars over time. However, tea tree oil is quite potent and may even irritate or burn sensitive skin. In order to reap the best benefits, always dilute tea tree oil before applying it on your skin. Diluting it with water is best for this remedy and will not cause any acne flare-up after use. 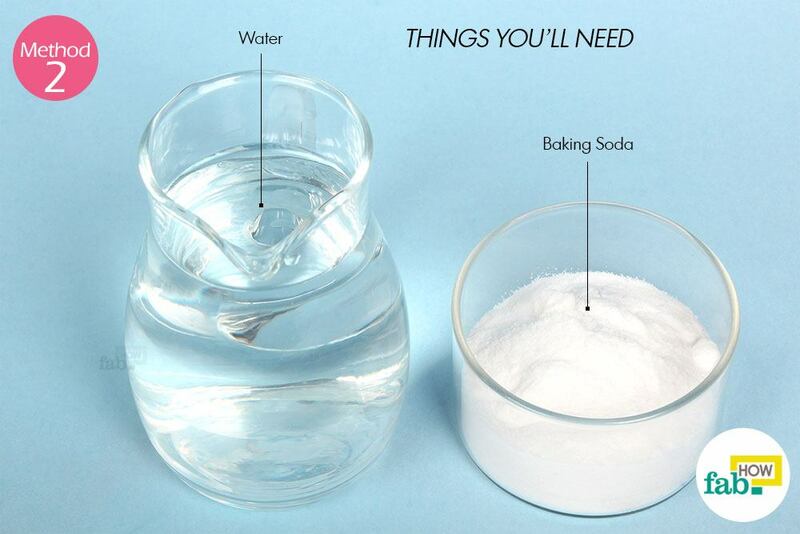 Put 2 tablespoons of water in a small bowl. 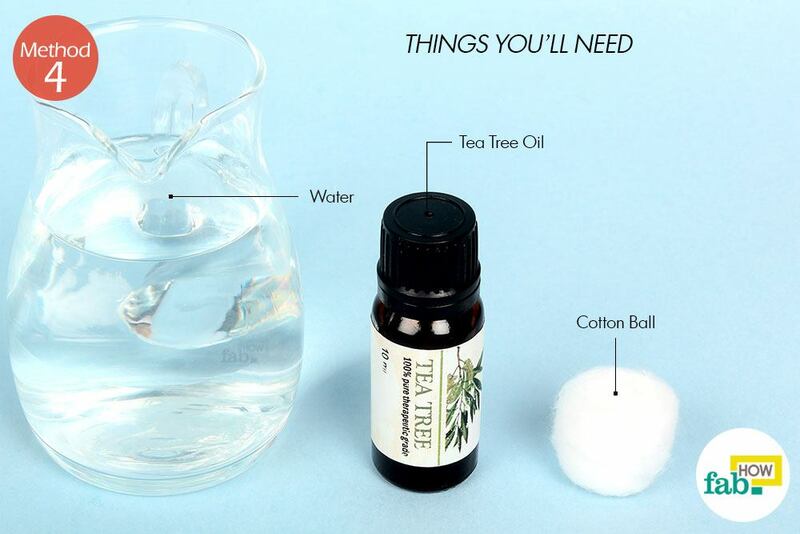 Add 4 or 5 drops of tea tree oil to the water and mix well. Keeping the ratio in mind, you can adjust the quantities depending upon your needs. 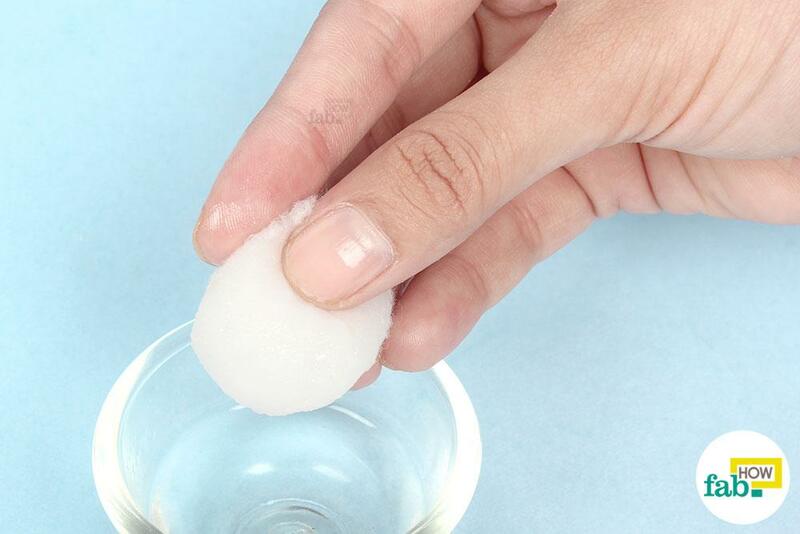 Using a clean cotton ball, apply the diluted tea tree oil on the acne scars. Let it stay for 10 to 15 minutes before washing it off with water. Do this daily for good results. Apple cider vinegar (ACV) is acidic in nature as it contains acetic acid. Just like lemons, ACV helps lighten pigmentation in the skin, thus reducing the appearance of acne scars. ACV also evens the skin tone and may prevent future scarring if included in your daily beauty regimen. Raw, organic and unprocessed ACV is the best when comes to this remedy. However, just like lemon, ACV can be quite potent when used on naked skin and may irritate the skin. 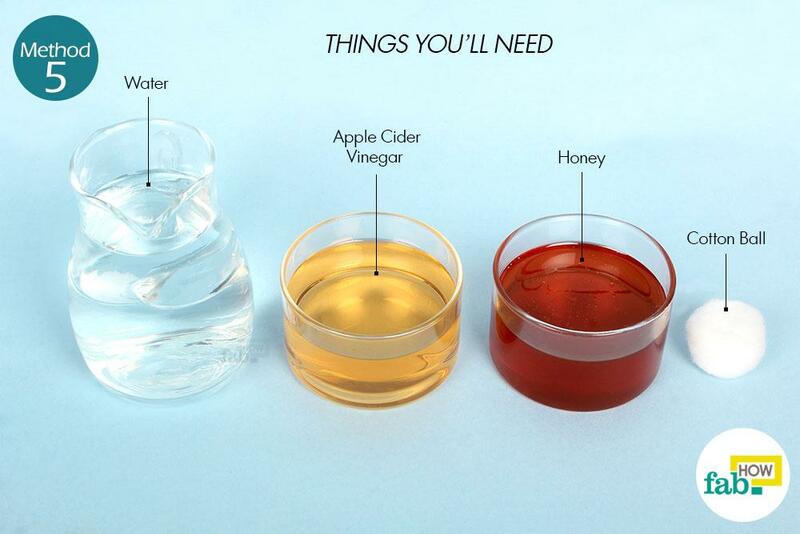 Combining ACV with honey and water dilutes it considerably without diminishing its properties. 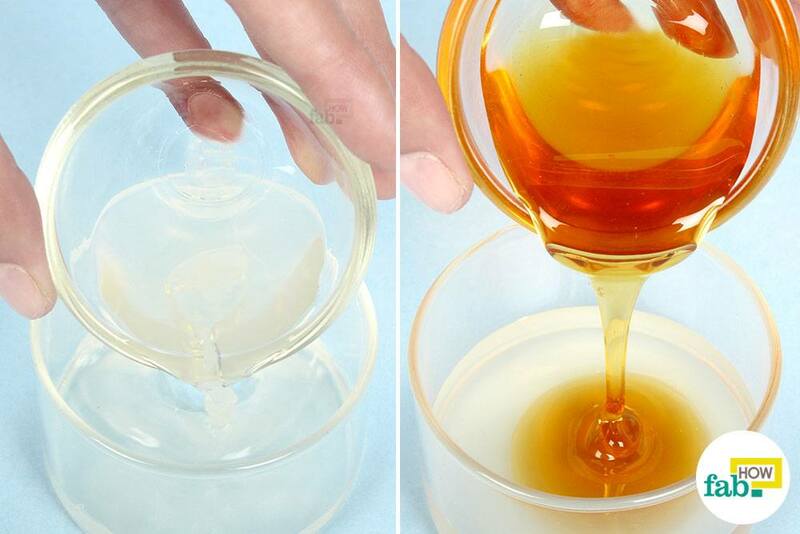 Honey, which itself can help reduce acne scars, counters the harshness of pure ACV and makes it agreeable to the skin. Pour 2/3 cup of water into a bowl. Add 2 tablespoons of apple cider vinegar (ACV) to it. Add in 2 tablespoons of honey as well. 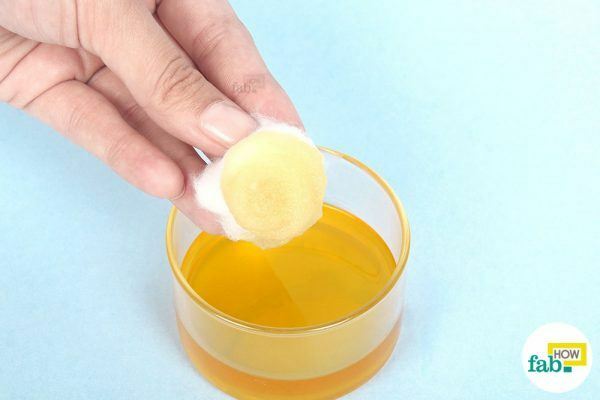 Use a cotton ball to apply the blend on the acne scars. Leave it on for 10 to 15 minutes or until it dries, then rinse it off with plain water. Use this method once a day regularly for at least 1 to 2 months for promising results. Potatoes contain vitamins and minerals that promote skin restoration. 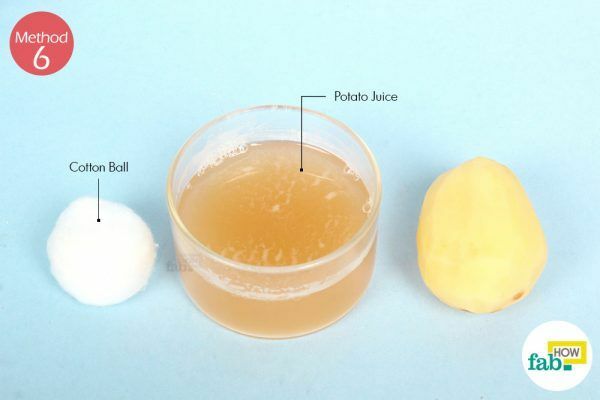 Therefore, raw potato juice applied topically can help fade existing acne scars over time. Potato juice can help lighten and even the skin tone. Having astringent properties, it can also help tighten the skin. Potassium, sulfur, chlorine and phosphorus present in potatoes make it an effective scar treatment. Using a cotton ball, apply fresh potato juice on the acne scars. Wait 10 to 15 minutes to let the potato juice dry. 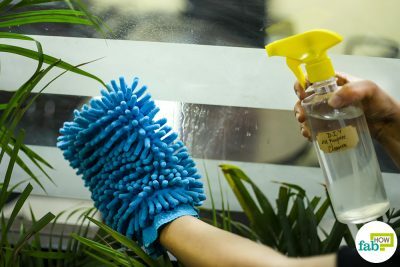 For maximum benefit, reapply fresh juice and let it dry as well. You can repeat this activity for up to 30 minutes. Wash it off with cool water and pat the skin dry. Use this once daily for 1 to 2 months to get optimum results. You can also repeat this twice a day without any side effects. While these remedies can be used for spot treatment of acne scars, remedies like lemon juice, honey-lemon, tomato-lemon, aloe vera, potato juice and ACV-honey can also be applied to the entire face to lighten the skin and even the skin tone. Most of these remedies can also help in treating acne and preventing the scars in the first place. Don’t step out into the sun for at least a few hours after applying lemon remedies. If you must go out, apply a heavy duty sunscreen first. 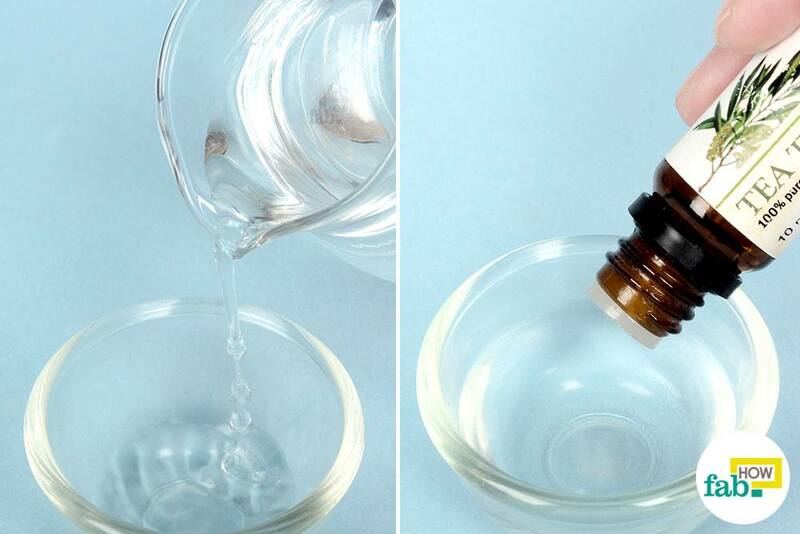 Instead of using plain water for diluting lemon juice or tea tree oil, you can also use rose water. Besides providing a pleasant fragrance, rose water also acts as an efficient toner. Just like fresh potato juice, using fresh and raw potato pulp as a face mask also helps with acne scars. As much as possible, resist picking on your acne to prevent scars. I am 60 years old and this product helps smooth lines and even complection. Dark circles reduced and lifts skin noticeably. Fresh organic is the best. It also acts a natural moisturizer it will leave your skin looking and healthier. This is an amazing collection of natural remedies to remove acme scars. I have acne prone skin. So I always look for natural remedies to cure this. Recently I am using Himalayan slat, Aloe Vera and rose water mixture for my acne. This remedy is amazing. I can see visible reduction in y acne. Himalayan is very good for the skin. It provides the requires minerals to the skin. I also use it as bath salt. It is great that something is working out for you. You can give the above remedies a try too and let us know how it worked out for you.